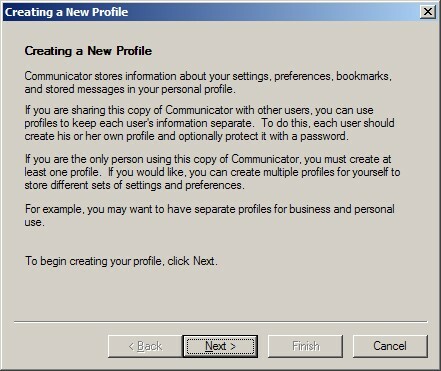 The 'Creating a New Profile' wizard will appear. This is where you can choose what name will be displayed in the FROM area when you send an email. A good idea is to use your real name or business name (if this is a generic mailbox). This is also where you type in your email address. This is the name that Netscape Communicator will use to store your information, so a good idea is to keep it the same as what you put in the previous screen for 'Your Name'. This screen will also allow you to setup where your Netscape Profile will be saved to. We recommend that you use the default directory already listed. Put a dot in 'POP'. Click 'Finish' and it will open up Netscape Communicator where you can click on the Mail & Newsgroups icon to launch your email program. You should be able to send and receive email.